It is with much sadness that I share with you news of the passing of our good friend and fellow bluebirder, Russ Heindselman. Russ passed away on Monday, August 8th at the age of 88. 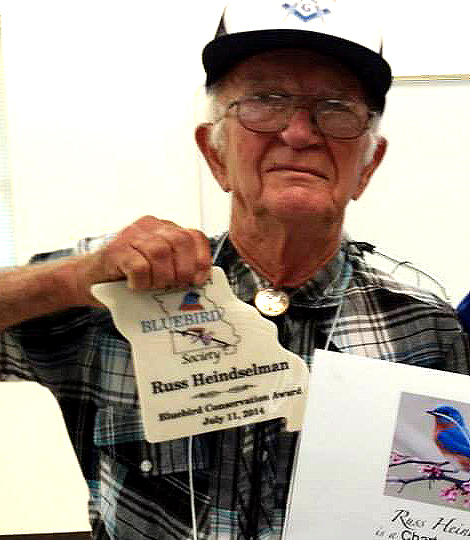 Because Russ’s family knew how much he loved bluebirds, they have chosen the Missouri Bluebird Society to be a recipient of memorial donations made in Russ’s name. We extend our heartfelt sympathies to Russ’s family and friends. He will be greatly missed by Missouri Bluebird Society members and by Missouri’s Bluebirds! This entry was posted on Friday, August 12th, 2016 at 3:52 pm and is filed under Uncategorized. You can follow any responses to this entry through the RSS 2.0 feed. You can leave a response, or trackback from your own site.